This website’s owner is FORJAS SANTA BARBARA SA, with Tax ID number A48529432 and with their registered office at BARRIO OGUENA SN 48340, AMOREBIETA-ETXANO (VIZCAYA), included in the Commercial Register in Volume 492, sheet 120, page BI-3873-A and entry 1a. The company contact email is: administracion@fsantabarbara.com. By browsing, accessing and using FORJAS SANTA BARBARA SA’s website constitutes the person as a user. As a result of browsing FORJAS SANTA BARBARA SA’s website, the said user accepts all the conditions of use established herein, notwithstanding the application of the corresponding obligatory regulations applicable in each case. The veracity and legality of the information provided by the user in the formulas requested by FORJAS SANTA BARBARA SA in order to access certain contents or services offered on the website. The use of information, services and data offered by FORJAS SANTA BARBARA SA contrary to what is established in these terms and conditions,the law, morality, good manners and public order, or any other use that might result in the violation of third-party rights or affect the proper operation of the website. FORJAS SANTA BARBARA SA is not responsible for the content of any of the websites the user might access through the links included on the website, and in no case will they examine or exercise any type of control over the content of other websites. In addition, they cannot guarantee the technical availability, accuracy, veracity, validity or legality of websites pertaining to others that may be accessed via the links. FORJAS SANTA BARBARA SA has taken all the necessary measures to avoid any sort of harm coming to the users of their website that may result from use of the same. Therefore, FORJAS SANTA BARBARA SA is not responsible, under any circumstances, for the possible damage that the user might suffer as the result of their Internet use. FORJAS SANTA BARBARA SA reserves the right to make any amendments to the content of its website it deems appropriate, without prior notice. This includes the content of the website, its Terms and Conditions of Use, or the General Terms and Conditions of Contracting. Such changes may be made via their website in any way permissible by law, and shall be binding during the time in which they remain published on the website and until they are modified by subsequent amendments. In accordance with the provisions of the current legislation on Personal Data Protection, we hereby inform you that your data will be incorporated into the processing system owned by FORJAS SANTA BARBARA SA, with Tax ID number A48529432 and its registered office at BARRIO OGUENA SN 48340, AMOREBIETA-ETXANO (VIZCAYA), in order to facilitate, attend to and meet the commitments established between the two parties. In keeping with applicable regulations, FORJAS SANTA BARBARA SA informs users that their information will be kept during the necessary period in order to fulfil the aforementioned conditions. FORJAS SANTA BARBARA SA also informs you that it will process the data in a lawful, honest, transparent, suitable, relevant, limited, accurate and updated manner. FORJAS SANTA BARBARA SA therefore undertakes to take all reasonable measures to ensure that they will be deleted or rectified without delay if they become inaccurate. In accordance with the rights conferred on you by the current legislation on Personal Data Protection, you may exercise the rights of access, rectification, limitation of processing, deletion, portability and opposition by sending your request to the postal address indicated above or by writing an email to administracion@fsantabarbara.com. 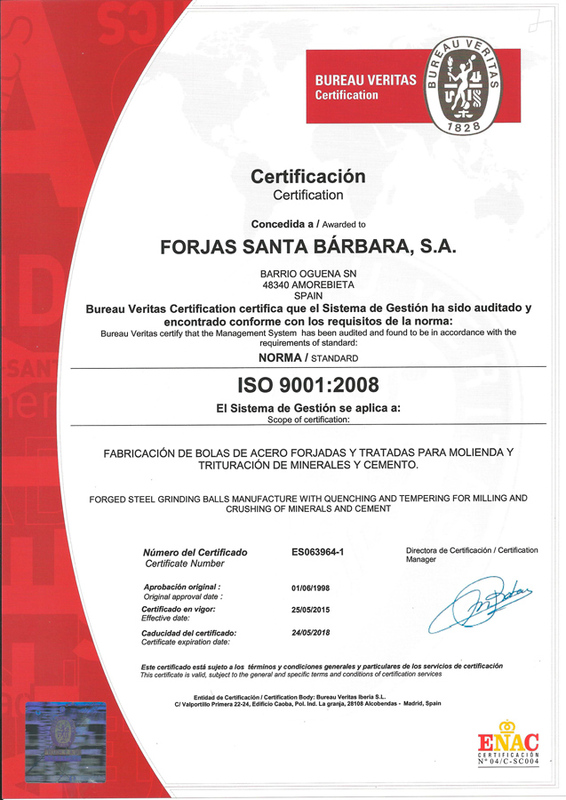 FORJAS SANTA BARBARA SA in its own right or as a franchisee is the holder of all intellectual and industrial property rights for its webpage. In addition, all elements contained therein (by way of illustration, images, sound, audio, video, software or texts; brands or logos, colour combinations, layout and design, selection of materials used, computer programs needed for correct operation, access and use, etc.) are held by FORJAS SANTA BARBARA SA. As a result, these works are protected as intellectual property by Spanish Law; in this case, both Spanish and European law in this area are applicable, as are international agreements on such matters to which Spain adheres. All rights reserved. By virtue of what is established in the Law on Intellectual Property, the reproduction, distribution or public communication of all or part of the contents of this webpage (including the means by which they are made available) for commercial ends, in any form or by any technical means are expressly forbidden without the authorization of FORJAS SANTA BARBARA SA. The user promises to respect the Intellectual and Industrial Property Rights held by FORJAS SANTA BARBARA SA. Users may view the elements on the site or even print them out, copy them or store them on the hard drive of their computer or in any other physical format, as long as it is solely and exclusively for their own personal and private use. The user must abstain from erasing, altering, evading or manipulating any protective device or security system installed on FORJAS SANTA BARBARA SA’s web pages. FORJAS SANTA BARBARA SA reserves the right to begin the civil or criminal proceedings which it deems appropriate due to the misuse of its website and contents thereof, or due to the breach of these terms and conditions. The relationship between the user and the service provider shall be governed by current legislation which applies in Spanish territory. Should any dispute arise, the parties may submit their disputes to arbitration or proceed through the regular legal channels, in compliance with the applicable rules on jurisdiction and competence. The registered office of FORJAS SANTA BARBARA SA is in AMOREBIETA-ETXANO, Spain.